Welcome to Michigan Barcode - Your one stop source for all of your Barcode, POS, & RFID needs. We treat all of our customers as partners - We want to provide you with the best possible solution for your organization. Our number one goal is to provide excellent service to our customers and to help them reduce costs and increase revenue. 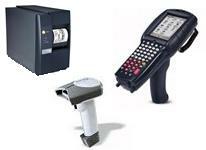 We sell and service all makes and models of barcode/RFID printers and scanners. We sell labels and ribbons for barcode & RFID printers. We program all printers and interface them to scales and other equipment. We do custom programming, inventory and product control. We sell & install point of sales systems. We are not box pushers. When we sell you a printer or scanner, you can rely on us to give you full service on that item. We can help you get the most out of your equipment with programming or other automation to help prevent costly human error. Nobody should ever have to enter data in more than once. Need barcode or RFID printers? Need barcode or RFID scanners? Need preprinted labels or hang tags? Need a point of sales system? Need an inventory, shipping / receiving solution?